I love a good art project and holidays always provide a great opportunity, especially with kids. 1. Every egg will get smashed to smithereens. 2. Little guys will eat smashed eggs, shell and all. 3. Dye cups at toddler height invite dogs to drink out of them. 4. Toddlers will pour the dye all over themselves… And laugh, then do it again. 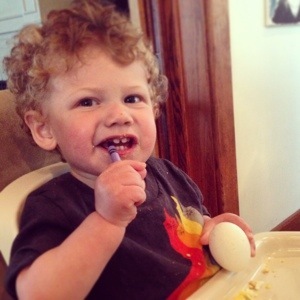 We started by coloring on the eggs with crayons in the high chair. 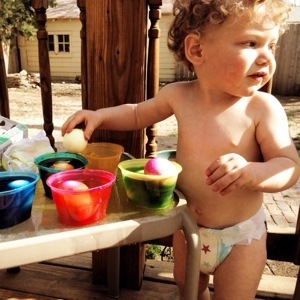 Then we took the eggs outside to dye them. By the end, we had zero of twelve eggs still in tact. But, we had a lot of fun. And, my dogs love hard boiled eggs, so they enjoyed a good treat! I hope your holiday and family time is just as enjoyable.